CARTEL DE TOROS PLAZA DE CHICLANA. 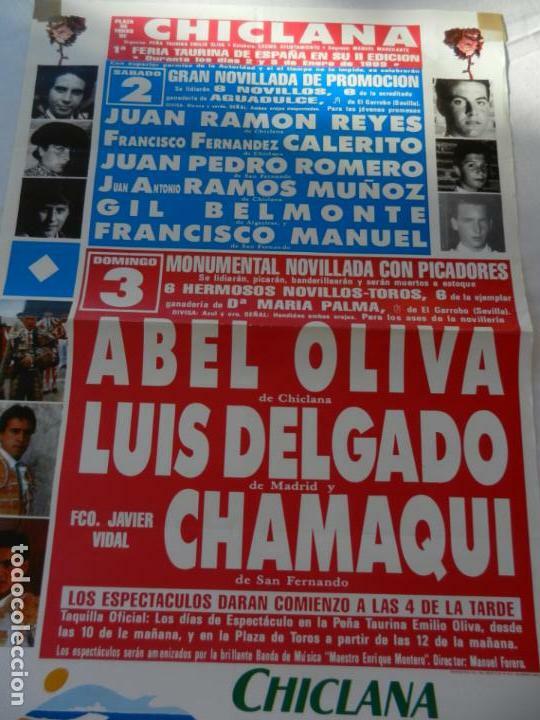 ABEL OLIVA, LUIS DELGADO, CHAMAQUI. 2 Y 3 ENERO 1998. JOVENES PROMESAS. JUAN R. REYES, FRANCISCO FDEZ. CALERITO, JUAN P. ROMERO, JUAN A. RAMOS MUÑOZ, GIL BELMONTE, FRANCISCO MANUEL. GANADERIAS. AGUADULCE Y MARIA PALMA. CARTEL DE TOROS. PLAZA DE CHICLANA. ABEL OLIVA, LUIS DELGADO Y CHAMAQUI. AÑO 1993. CARTEL DE TOROS. CONIL. ABEL OLIVA. CHAMAQUI. EL POLI. CARTEL. PLAZA DE TOROS DE CHICLANA. 1993. ABEL OLIVA. LUIS DELGADO. CHAMAQUI. Offizielle Uhrzeit TC: 03:52:40 TR: 121 ms.